WE’RE CREATING A CLUB FOR OUR SHOPPERS, WHERE YOU CAN GET A LITTLE SOMETHING EXTRA SPECIAL FROM EVERY VISIT TO THE JUNCTION. Our free loyalty scheme, the Connection Club gives you fabulous exclusive offers and we’ve made it quick and easy to join. Simply ask in participating stores, call in at our Visitor Information Centre or fill in our form opposite for a host of extra discounts in selected stores. As a member of the Connection Club, we are always surprising you with something wonderful when you least expect it. Each month we will send you our latest exclusive offers, direct to your inbox. 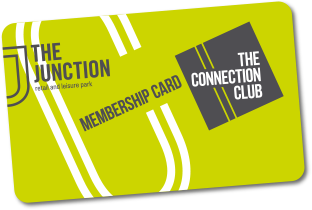 With our events and promotions there is always something going on at The Junction, but that buzz is even more exciting as a member of the Connection Club. Being a Connection Club member also gives you previews, exclusive events, offers and much more. You can still use your old VIP Club Card to enjoy all the same benefits until April 2018. To update your current VIP card to a Connection Club card, simply make a request at our visitor information centre. The Junction also offers a warm welcome to all coach parties and drivers. Every coach passenger is greeted personally and given a site map and their exclusive Connection Club vouchers, offering an extra discount in many of our stores including Marks & Spencer, Clarks, Denby, Nike and many, many more. For full terms and conditions about Connection Club, please click here. Sign up to become a Connection Club member today and receive exclusive offers and discounts.